All PARKSTONE homes currently listed for sale in Sandy as of 04/18/2019 are shown below. You can change the search criteria at any time by pressing the 'Change Search' button below. "Spacious townhouse style condo with a main-floor living in a newer centrally-located Sandy complex! Pets allowed! Vaulted south-facing windows on the main floor so the winter sunshine pours in but summers are cool and shaded! GORGEOUS professionally landscaped private yard with patio and lawn space - mowed, edged, and tidied by the HOA! 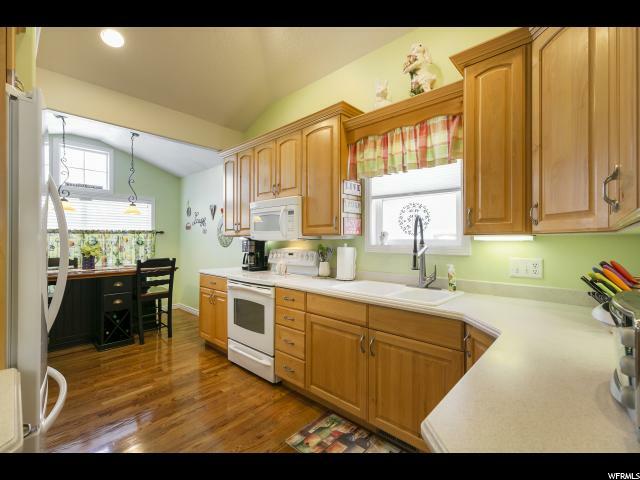 Lovely spacious maple kitchen with beautiful window nook for your table, newer appliances, under-cabinet lighting, upgraded fixtures! Space for formal dining, comfortable vaulted living room with a gas fireplace and south-facing windows! Big main-floor master suite with south-facing bay window, lots of closet space, full bath with a jetted tub and walk-in shower, 2-sink vanity, and and built-in cabinets. This unit has an opened up and fully finished second-floor den which other units in the complex do not have. Both upstairs bedrooms have nice closet space and large windows. Don't miss the linen closet behind the door in the upstairs bath and the large closet in the upstairs hallway! Downstairs is a full-footprint open basement fully insulated and ready for your finish or just to use as storage! Largest model in the complex! New $10,000 Lennox furnace and air conditioning system in July 2018. Alarm system! Gas connection on the patio for the grill! HOA covers lawn care, snow removal, gutter cleanout, saltwater in-ground pool with hot tub, play area, and street maintenance (streets redone 2-3 years ago). MUST see to appreciate."